Big man Daniel De Guzman shone in offense as Trinity University of Asia turned back Nyro Saints, 76-69, and captured the Open Division title of the QCBL First Conference at the NRMF Gym in Fairview. 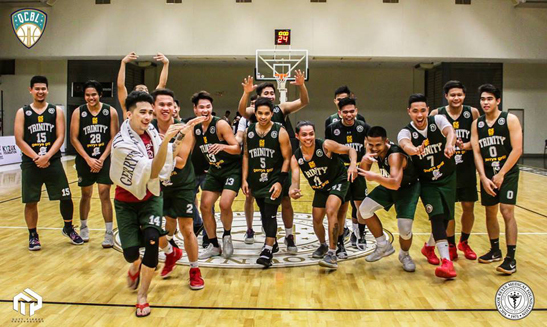 The winning Trinity University of Asia Stallions whoop it up after capturing the first QCBL Open Division title. The steady slotman scored almost at will from inside and out of the paint, on the way to a top-scoring 29 points on top of nine rebounds to give Trinity the confidence as the team prepares for its next bigger tournament. Coach Alvin Grey said they are using the QCBL as an exposure for tougher games ahead, particularly in the PBA D-League, where they are seeing action for the first time. “Magandang chances sa amin itong paglalaro sa QCBL para makapag-gel ang mga bata. Ang ganda nga agad ng teamwork nila dito,” said Grey, who has new seven players in his fold, including De Guzman. Ably aiding De Guzman were old reliables Joshua Montero and Christian Goduco, who had 9 and 8 points, respectively. Leading the Saints’ losing cause were Dave Tecson and Jherald Manacho, who combined for 31 points. In other finals matches, SSI Metal defeated Magic Seven, 96-87, to rule the Cadet Division, while Nemesis beat Regalado Vet, 101-90, to bag the Starter Division title.